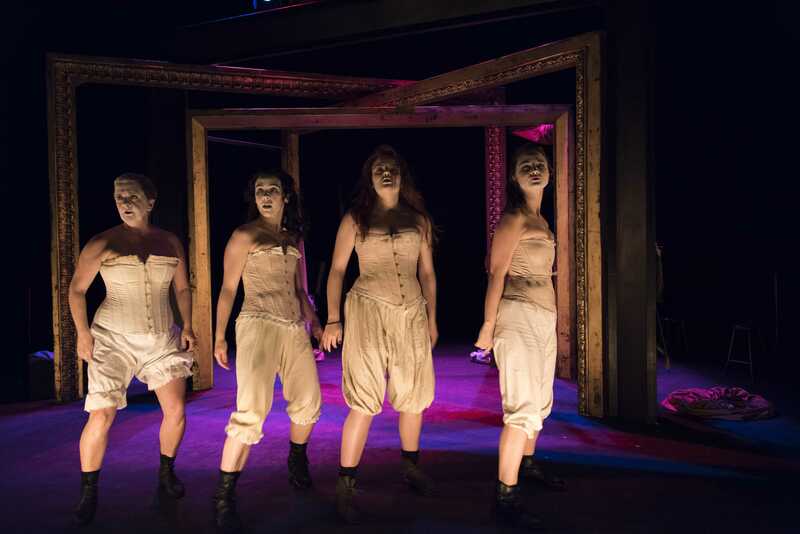 Offering a mix of comedy, horror and pathos, ‘Playhouse Creatures,’ which tours Ireland this week, is a riveting theatrical tour de force by five talented actresses highlighting the immense difficulties faced by their counterparts plying their trade more than four centuries ago. 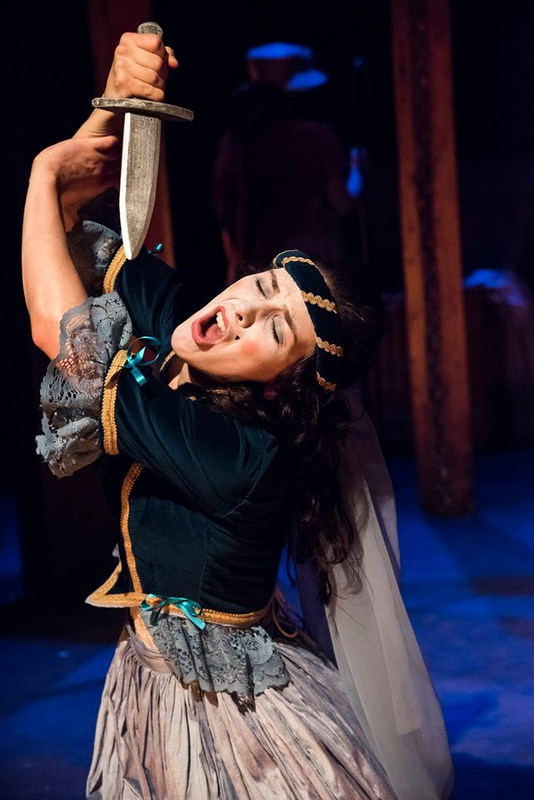 With minimalist scenery consisting of giant gilded frames and a wicker hamper with costumes strewn across it, the Belfast-based Bruiser Theatre Company delivers a fast-paced, precisely timed performance that vividly re-creates the atmosphere of a theater in the mid-1600s. Full credit goes to Lisburn Island Arts Center, a leading regional theater in northern Ireland, for hosting the show. In one sense, the play illustrates yet another example of how women have been marginalized and demeaned through history. In another, it illustrates the sheer perseverance they showed to be recognized in their own right. 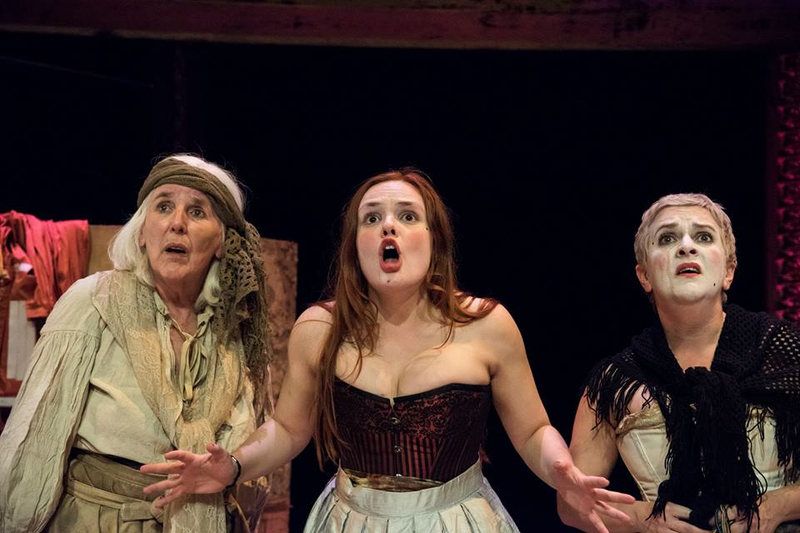 At times coarse, at others poetic, ‘Playhouse Creatures,’ written by April De Angelis, provides a revealing account of struggle by the first wave of actresses in the bear pits of English theatres against the prejudice of the industry and the jeers of the public. Indeed, while the recurring analogy to performing bears seems at first glance to be a tad exaggerated, as the play progresses and one learns more about the cruel treatment of actresses by a society unused to women on stage, the similarities become chillingly clear. And the nastiness is not just from the taunts of ignorant mobs but the cold, calculated actions of the so-called sophisticated upper classes taking advantage of talented, vulnerable, often pretty, actresses. The play is linguistically rich, with off-stage accents taking on an earthy Cockney hue while ‘on-stage’ ones are infused with the formal enunciation and complexity associated with the profession. As befitting the era, all the actresses wear white face paint, which lends itself to creating even more animated expressions. Comedy is the territory primarily of Claire Burns playing Nell Gwyn whose street slang and turn of phrase is both amusing and hard-hitting, not surprising considering Nell was a ‘rags to royalty’ Restoration actress known as ‘pretty, witty Nell’ who had two sons fathered by King Charles. 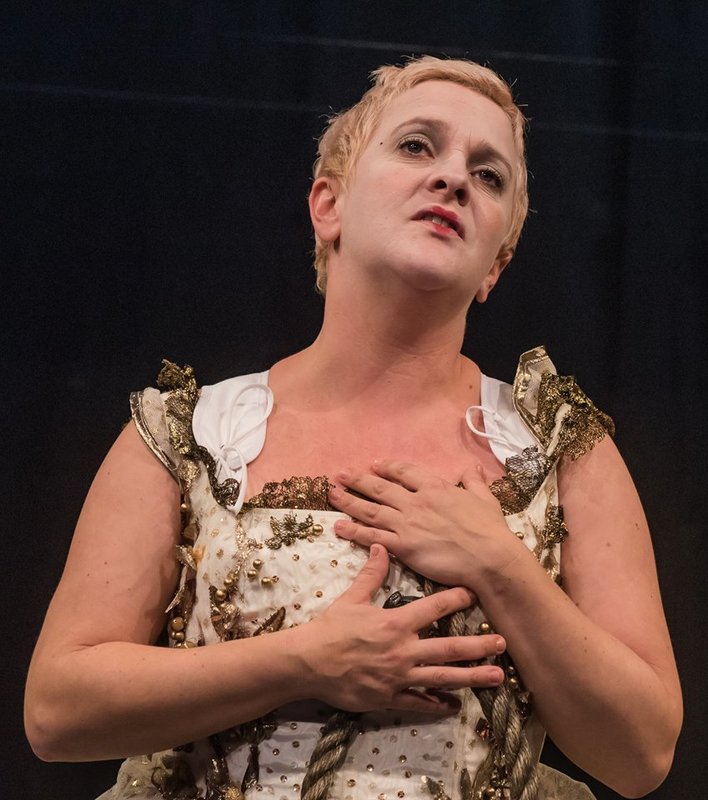 Other comedic moments are provided by Jo Donnelly, who as Mrs. Betterton is a devotee of the ‘clockwork’ form of acting whereby an actor can express different moods by bodily adopting different hour and minute hands on a clock. Horror comes in the form of a bloodless, simulated abortion using a sharp instrument. With sheer survival at risk, rivalries between actresses in those days were severe and pregnancy often meant penury for both mother and child, an unfortunate fate that awaits one of the characters. Growing old was almost as bad for an actress as becoming pregnant – a situation not too unlike today – and pathos reigns as Mrs. Betterton struggles to face the inevitable. In an era when class-consciousness was deeply pronounced, a close third in terms of potential difficulty was the wrath of someone from the influential upper tier of society, as illustrated when Mrs. Marshall, played by Roisin Gallagher, responds angrily to an insult from such a person, but then has to deal with the consequences. Providing a moral compass throughout is the grounded character of Doll Common as played wonderfully by Roma Tomelty. Cleaner, dresser and general dogsbody, the older woman witnesses the rise and fall of each actress with a detached but empathic air. 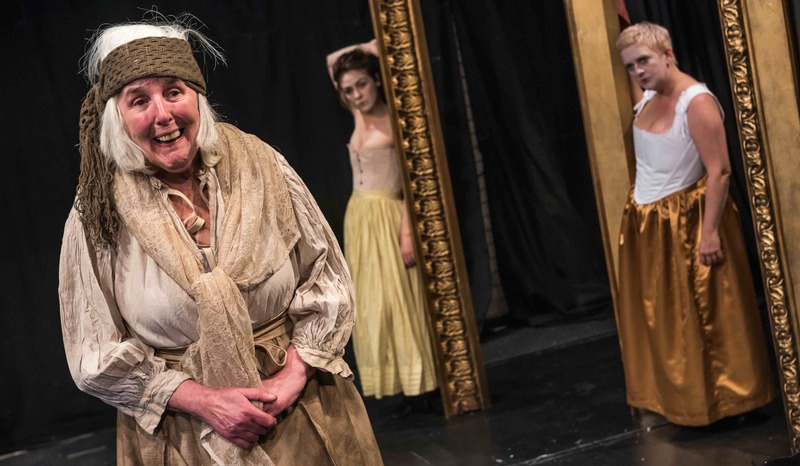 The persona of each character in ‘Playhouse Creatures’ is so finely drawn that they complement each other perfectly. Established in 1997 by Lisa May who is its artistic director, Bruiser Theatre Company’s ‘Playhouse Creatures’ is an innovative production combining text and physical theatre techniques. Music is provided by orchestrator and composer, Matthew Reeve. The tour of ‘Playhouse Creatures‘ continues this week. Posted in Arts & EntertainmentTagged Bruiser Theater Company, Island Arts Center, Lisburn theatre, northern Ireland live entertainment, Playhouse Creatures, stage performances in Ireland, what to see in Ireland, women in theaterBookmark the permalink.